As you have probably figured out by now, the whole misguided "Red Sox Chatter" hoax was just that: a hoax. 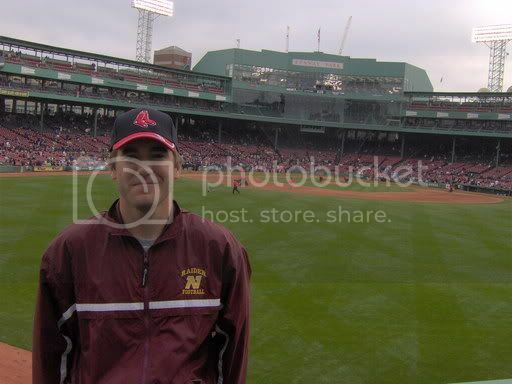 As I hinted a few weeks ago, I had planned a trip up to Boston and New York for late May (right after school got out) to attend a few ballgames and such. My roomie and I thought it would be sorta funny to play a little trick on the readers, so we concocted the new logo and alternate persona. You may not have thought it was super funny (and I didn't do my part by only posting twice as my alter ego, "Hacker T. Daniels") but we still got a few chuckles out of it :). Plus, the new logo did look pretty sweet. So I was in attendance at Saturday's 17-1 romp of the BoSox over the hated Yanks, which many of you probably saw on national TV. It was a fun game to be at for sure, as all the Yankee fans got disgusted and left by the sixth inning. It allowed us to move down for some great seats! Anyway, today marks the end of "Red Sox Chatter". Twins Chatter returns in all its Lew Ford-inspired glory tomorrow, and since school is now out, I'll have plenty of time to provide some much-needed commentary on the Hometown Nine. Until then, I have just one piece of advice for you: enjoy the season! And just who is this fellow with the historic (and beautiful) ballpark in the background? 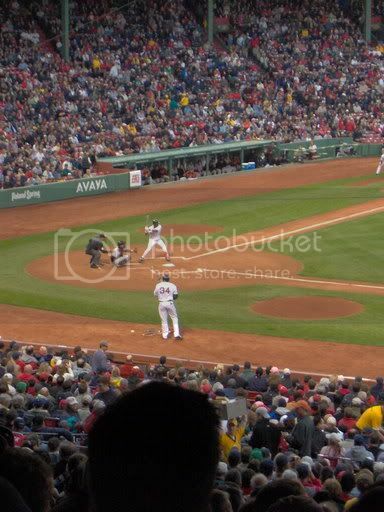 The view from our seats at Fenway (they put ANY Dome seat to shame).